With the passing of days, the number of people asking me how to uninstall SQL Server 2005 instances successfully is on increase. I would like to say that it is a simple question but quite difficult to answer as there are many related components installed which need to be uninstalled by following a correct order, otherwise, we are going to fail. Today's post is going to explain my own technique to do it with ease and success. 1. Firstly, we do have to find the right directory where 'ARPWrapper' tool is installed (usually it is inside of either 'C:\Program Files' or 'C:\Program Files (x86)' folders). After doing that, we can start the tool by executing one of the two following commands via CMD with '/remove' parameter included. Having done that, 'ARPWrapper.exe' will start and we will be able to choose the SQL Services we want to uninstall. The wizard shows two parts: the first one lists the server components and the second one the common components. 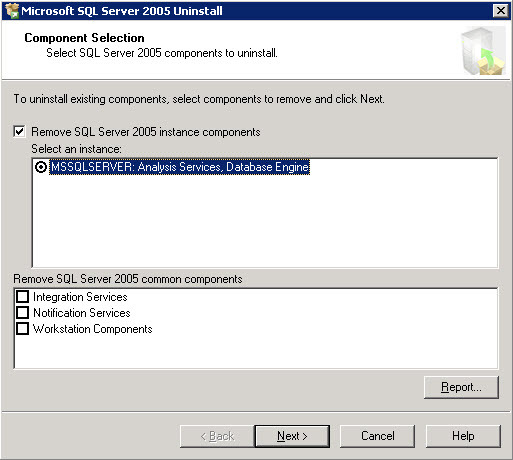 Because we only want to uninstall all server components (Database Engine, Analysis Services, SSIS, and etc. ), we will select the first one and then click on 'Next' and 'Finish'. 3. Remove 'Microsoft SQL Server Native Client' component by using 'Add or Remove Programs'. 4. Remove 'Microsoft SQL Server Setup Support Files' component by using ''Add or Remove Programs'. 5. Finally, we have to restart the server. To sum up, not only do we have SQL Server 2005 uninstalled successfully, but also very cleanly by following some simple and practical steps. Now this task is not going to be a pain in the neck any longer. I hope you find this post very useful and make the most out of it. That is all for now, let me know any remarks you may have uninstalling SQL Server 2005. Thanks for reading. Stay tuned.